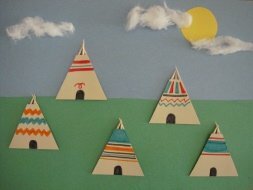 This Tepee Village Craft is an easy and fun way to learn about Native American Culture! This collage is made with simple materials found around the house! 1. Prepare your paper. Cut a strip of green paper, for the grass, and glue it onto a full piece of sky blue paper. 2. Cut triangles out of paper and cut off the top tips. We used light brown paper for our Tepee's. 3. Decorate your Tepee's with markers, crayons or other embellishments. 4. Turn your Teepee's over and glue 3 toothpicks on the back of each one. One toothpick on either side and one in the middle. 5. Glue your Tepee's all over your grass to make your village. 6. To finish off your collage cut out a yellow sun and pull apart some cotton ball clouds to glue onto your paper.